November 15, 2011 - The U.S. Travel Association expressed its strong support for the robust travel facilitation agenda pursued by the Obama Administration as part of its hosting of the Asia-Pacific Economic Cooperation leaders’ summit in Honolulu. The U.S. Travel Association expressed its strong support for the robust travel facilitation agenda pursued by the Obama Administration as part of its hosting of the Asia-Pacific Economic Cooperation leaders’ summit in Honolulu. At the summit, President Obama signed into law H.R.1487, the Asia-Pacific Economic Cooperation Business Travel Cards Act of 2011, which will allow U.S. business leaders access to the APEC Business Travel Card program (ABTC) to promote swift and secure travel across the Asia-Pacific region. Under the bill, U.S. Customs and Border Protection are authorized to issue the ABTC to U.S. citizens as part of its Global Entry program. Card holders will receive expedited scheduling of visa interviews and access to fast-track immigration lanes at airports in APEC's 21 economies. “This common sense legislation is the type of ‘smart travel’ initiative necessary to boost economic productivity and show the world we can secure international travel with risk management tools,” said Roger Dow, president and CEO of U.S. Travel. “We congratulate the Administration and Congressional leaders such as Senators Maria Cantwell and Daniel Akaka, and Congressmen Rick Larsen and Kevin Brady, in crafting a bipartisan bill to bring the U.S. into the ABTC program.” In addition, the Obama Administration announced the broader “APEC Travel Facilitation Initiative” which will expand bilateral travel in the region. The APEC Travel Facilitation Initiative is a multi-year action plan for expediting the flow of increasing numbers of passengers in the APEC region. The Initiative focuses on promoting improvements in passenger security screening on departure, as well as immigration and customs processing on arrival; fostering regional adoption of best practices; and pursuing “next generation” approaches to make the travel process faster, easier, and more secure for travelers. With traveler volume numbers expected to increase in the coming decades, these efforts by APEC and the United States reflect the economic importance of travel to and within the Asia Pacific region, the world’s biggest air passenger market. According to the International Air Transport Association (IATA), airlines carried 647 million travelers across the region in 2009, with this number expected to increase to one billion by 2014. The number of air travelers globally is also projected to grow from 2.4 billion in 2010 to 16 billion by 2050, with much of this growth expected to occur in the Asia-Pacific region. The U.S. and South Korea set a target date of January 2012 for implementation of the bilateral trusted traveler relationship where South Korean citizens can apply for the U.S. Global Entry program and U.S. citizens can likewise utilize the Korean Smart Entry System. 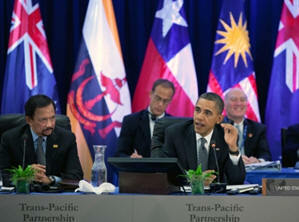 Also, the U.S. announced the intention to build a similar reciprocal agreement with Singapore. The United States will soon implement a Trusted Traveler arrangement with the Republic of Korea and is working to establish a similar partnership with Singapore in the near future. These arrangements will allow eligible, pre-screened citizens to clear immigration and customs expeditiously using automated kiosks when traveling between the United States and these countries. One of the long-term goals of the APEC Travel Facilitation Initiative is to create a regional network of trusted traveler programs. The United States and the Republic of Korea will implement a bilateral trusted traveler arrangement, with a target date of January 2012. This arrangement, agreed between the two countries’ immigration authorities last summer, would link the U.S. Global Entry Program and Korea’s Smart Entry System, allowing eligible, pre-screened U.S. and Korean citizens to clear immigration and customs expeditiously using automated border gates when traveling between the two countries. The United States and Singapore are committed to work towards a similar bilateral trusted traveler arrangement. President Obama and Prime Minister Lee have instructed their respective officials to work closely and expeditiously to achieve this goal.